Real Monarchs SLC score three goals in the final 20 minutes to steal three points and a 3-2 victory over Sacramento Republic FC at Bonney Field. Republic FC dominated the scoring chances department in the first 25 minutes of the match. Forward Adam Jahn had the first scoring chance for Republic FC in the 10th minute when he sprinted past the defense and onto a dangerous through ball from midfielder Octavio Guzman. Jahn was able to flick the ball past oncoming Real Monarchs keeper Eduardo Fernandez, but still had to beat two defenders. Jahn fought off one defender and sent a shot at the goal but could not find the far post as the shot rolled wide and out of play. Real Monarchs nearly scored in the 27th minute when midfielder Maikon Orellana got on the end of a looping cross. Republic FC keeper Dominik Jakubek had to come off his line to deal with the cross but could not get a glove to the ball. Orellana barely got a touch to the ball as he sent it back across the face of the wide open net, but it rolled all the way to defender Kip Colvey who was able to clear the ball away, keeping the match scoreless into the break. Republic FC broke the tie in the 54th minute when forward Cameron Iwasa was fouled just outside the box on the left wing. Midfielder Danny Barrera then stepped up to send a left-footed, out-swinging free kick into the box. Defender Mike da Fonte beat his marker to the ball and drilled a header past Fernandez and into the back of the net. The goal marks consecutive games that da Fonte has scored for Republic FC and the assist marks the fourth consecutive game Barrera has assisted a goal, extending his own club record. Barrera added to the score line with some more set-piece magic in the 57th minute. 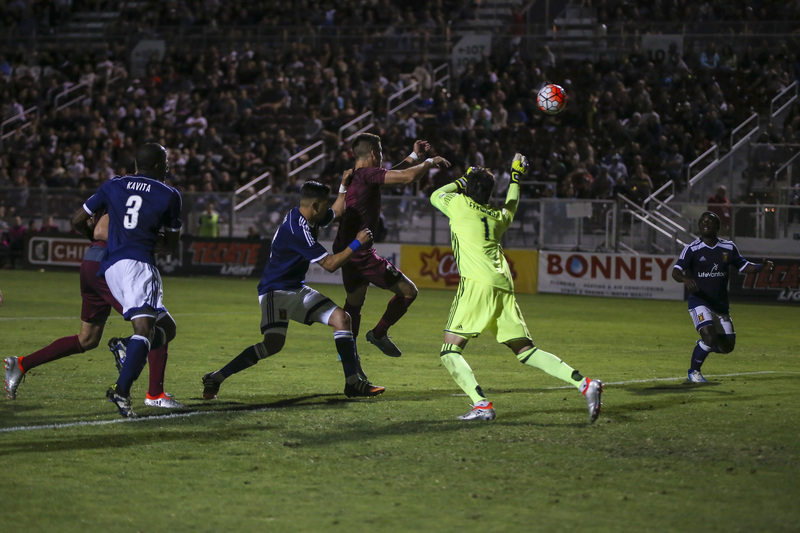 The Republic FC captain sent a left-footed, in-swinging free-kick from the right wing. The free-kick inexplicably sailed through a parade of bodies and Fernandez could not find the ball in the chaos. The ball ended up in the side of the net for the 2-0 lead for Republic FC. Real Monarchs pulled one back in the 72nd minute thanks to a wonder strike from captain Ricardo Velazco. The midfielder found space on the left wing and sent a right-footed curling shot from just outside the box. Jakubek tried to get a glove to the shot as he dove to his left but Velazco’s strike was perfectly placed as it got up and over Jakubek and into the upper corner of the net, making the score 2-1. Velazco would help pull the Monarchs even in the 82nd minute when he sent a flicked through ball header past the defense. Second-half substitute forward Kevaughn Frater ran onto the ball and send a one-time, left-footed side-volley on goal. Frater’s shot sailed past Jakubek and into the back of the net for the equalizer. The Monarchs would get the deciding goal in stoppage time. Velazco was the aggressor again for the visitors as he attacked up the left wing, He cut inside and sent a shot on goal, with Republic FC defender Derek Foran marking him. Foran attempted to use his head to block the shot away, but instead deflected the ball past into the back of the net for a stoppage-time own goal to decide the match. Republic FC will begin a stretch of five straight road matches when they travel to Orange County to take on Orange County Blues FC on Sunday, July 10. Kickoff is 4 p.m. The match will be streamed at SacRepublicFC.com/matchday. Justin Braun scores his fourth USL goal of the year, but Real Monarchs equalize late as Republic FC settles for 1-1 draw. Republic FC enjoyed most of the possession early in the match. Forward Thomas Stewart had the first real chance of the match in the 34th minute. Stewart sent a header on goal from inside the six-yard box after a Rodrigo Lopez cross was deflected. Real Monarchs keeper Eduardo Fernandez was there to block it away however and kept the match scoreless going into the half. Republic FC continued to dominate possession to begin the second half and in the 67th minute it would pay off. Midfielder Rodrigo Lopez attacked with the ball on the left flank and got into the box. Lopez then picked up his target, Justin Braun, and drilled a cross through the air that found the forward’s head. Braun calmly redirected the cross into a wide open net after Fernandez was forced to defend the threat of Lopez. The goal was Braun’s 4th in USL play in 2015 and the assist adds to Rodrigo Lopez’s all-time USL record. Real Monarchs capitalized on a counterattack opportunity in the 86th minute. Second-half substitute Lucas Baldin sprinted up the left flank of the Republic FC defense and received a through ball from forward Emery Welshman. Baldin continued towards goal and was able to wrap a right-footed curler around oncoming Republic FC keeper Patrick McLain for the equalizing goal. 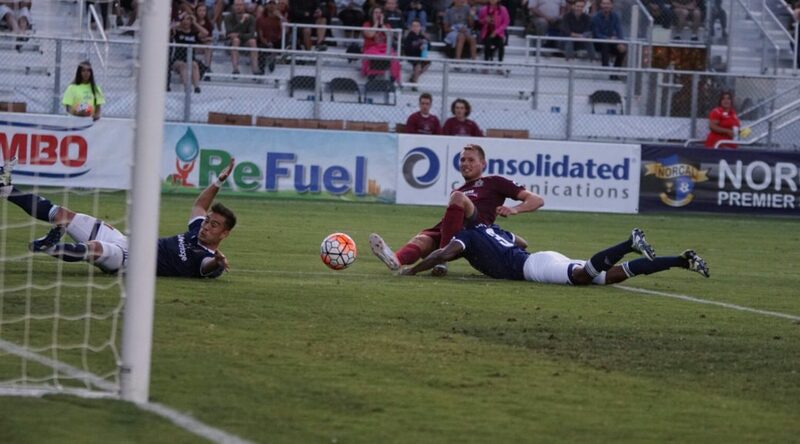 Republic FC forward Gabe Gissie, in his first USL start of the season, had a chance for a winner in stoppage time, but his left-footed side-volley went just high keeping the score 1-1. 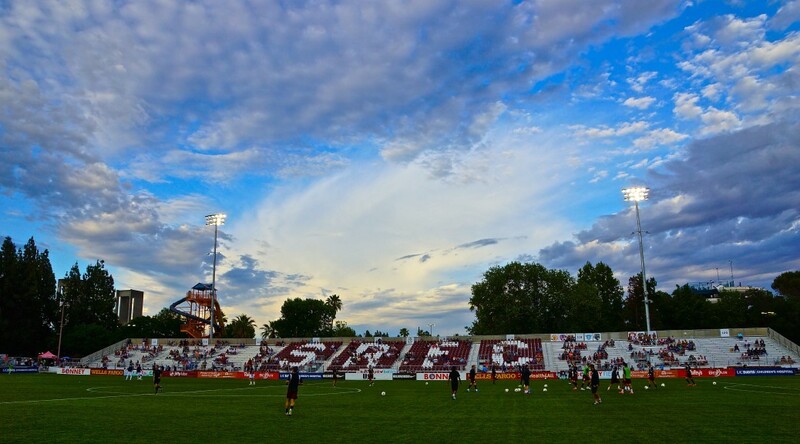 Republic FC will be back in action again on Saturday, August 22, when they take on Tulsa Roughnecks FC at Bonney Field. Kickoff is 8:00 pm. A limited number of tickets are still available at Ticketmaster.com.